VALERY RYBAKOW a Member of the Professional Artist Union of Russia. Impressionism; direct perception of the world - of naive art. genre, organically, missed "by itself". endless expanses of the fields. can save mankind: it heals the wounds, gives hope for the future, is the world of love and happiness”: says Valery Rybakow. in love with painting with oil and pallette-knife. Every artwork is the result of long painting process; every canvas is born during the creative search; every painting is full of my inner world. Each of my paintings brings different moods, colours and emotions. I love to express the beauty, harmony and spirit of this world in my paintings”: says Valery. that art helps us to be free from aggression and depression. Valery Rybakow, Russian, was born in Belarussia. "Intex", where he was developing the design of television programs. independent study of the creative heritage of painters from past Centuries. Since 2010, a member of the Professional Artists Union of Russia. Zurab Tsereteli. Happy for you! " IIn 2010, a solo exhibition held in Baranovichi, Belarus. In 2010 he published the photo book "Light painting palette knife"
In 2011 he participated in an exhibition of fine art "Declaration of love"
In 2011 he took part in the competition of Fine Arts "Temples Berasteyshchyny" second degree diploma. In 2011 he took part in the international competition "3rd Ward Open Call"
In 2011 he took part in the international contest "Illustrators of the Future Contest"
In 2011 he opened a solo exhibition, "The sky is getting closer ..." . In 2011, donated the painting "Way to truth 201" to the museum. In 2011 he participated in a regional open-air artists' Krayavidy Berastseyshchyny ", dedicated to historical places Lyakhovichi area. In 2011 he took part in the international competition "Art Takes Miami 2011"
In 2012 he took part in the international competition "Artists Wanted"
I am glad to inform, that since recent time I sell the canvases and on Internet (http://www.rybakow.com/). 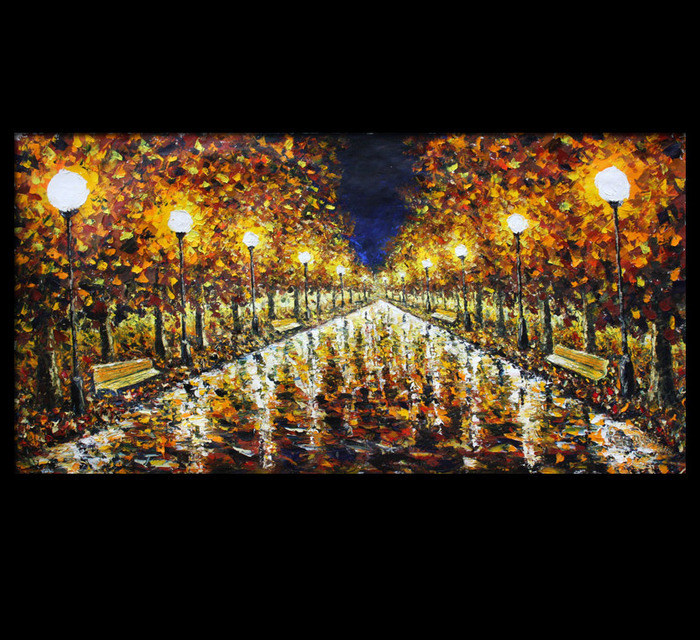 The 26 X 54" painting has been painted by an artist in Belarus named Valery Rybakow. His work is canvas, oil and palette knife.